Based on the jewelry theme, PlayNGo’s Jewel Box slot is packed with lucrative features such as bonus games, scatter wins, multipliers, and an optional gamble feature. 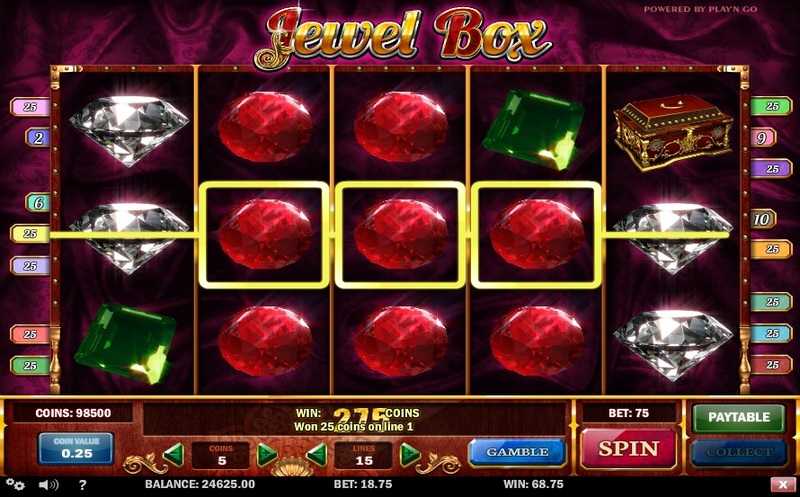 Jewel Box is played just like any other slot in the industry. Players first place a bet and then hit the Spin button to set the reels spinning. If a winning combination of symbols is created on the reels at the end of a spin, players will receive payouts according to the game’s pay table. If there is no payout, players can place another bet and try again. The slot has 15 paylines, and players need to first select the number of paylines to play. They can then bet up to 5 coins per active payline, choosing from coin values such as $0.01, $0.02, $0.02, $0.10, $0.20, and $0.25. The max bet is $18.75, which makes Jewel Box very popular among low-stakes players. Jewel Box comes with an Autoplay feature, which players can use to spin the reels automatically. One of the most beautiful slots developed by PlayNGo, Jewel Box is based on the jewelry theme. The reels resemble a wooden jewelry case studded with brilliant diamonds. The symbols on the reels are those of pearl earrings, rings, brooches, rubies, sapphires, and diamonds. Jewel Box has four wild symbols in the form of multiplier values x2, x3, x4, and x5. If players land one of these multipliers on the reels, they will serve as wilds, substituting for other symbols and creating winning combinations. The payout for that combination will be multiplied by the multiplier value before being credited to players’ accounts. On the downside, these wilds appear only on the third reel. The slot also has a scatter symbol in the form of a Jewelry Box, but it appears only on the first, third, and fifth reels. If players land the scatter symbols on the first, third, and fifth reels, a pick-and-choose type of bonus game gets activated, challenging players to select one of the jewelry boxes on the reels and reveal prizes as large as x150 their bet amounts. The slot also comes with an optional gamble feature, which gets activated as soon as players win a payout. This feature challenges players to double or quadruple their payouts by guessing the correct color or suit, respectively, of the face-down card on the screen. Players can win up to 2,500 coins in this feature. Jewel Box is popular because it offers plenty of chances to win through a multiplier value of up to x5, scatter wins of up to x150, and gamble wins of up to x2,500. In addition, players can win a top fixed jackpot of 2,500 coins by landing five sapphire ring symbols along a line. The slot is available at any casino that offers PlayNGo slots.